10/26/2011 – Dylan is officially walking on his own!! That’s right folks, you heard it here first… Dylan is officially walking on his own! His balance still needs a little tweaking, but for the most part I think we’re ready to send him out into the wild! Just kidding, but he is doing very well and we’re very proud of his progress to this point. Next bench mark… potty training!! 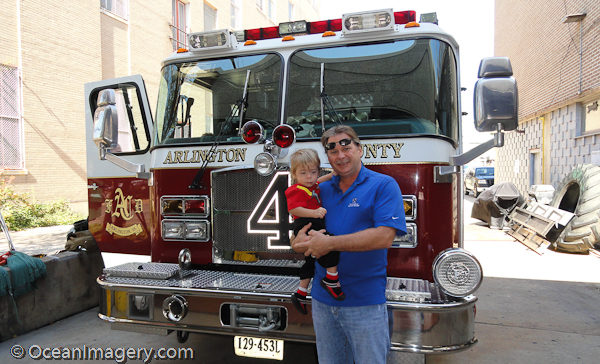 Dylan and Dad checking out one big Fire Truck… Oh sorry, I meant Urban Rescue Vehicle! Arlington County Fire Department held their annual fire safety open house recently and Dylan, Julie and I made an appearance at our local fire station on 10th Street. It was a nice day for the middle of October and all the doors at the station where open, but once we got inside we realized that most of the fire engines were out on a call. Oh well, it still turned out to be a fun day and Dylan even got his picture taken with some of the fire fighters from Engine Company #4! 8/30/2011 – Some of Dylan’s very first steps! Dylan is finally starting to get his ‘move’ on! Yep, he’s learning to trust his balance and starting to take some unassisted steps. At this rate he should be walking on his own by the end of the month! Although, I’m not sure if that’s a good thing or not, but it will surely help with my sore shoulder.